"Classic green bean casserole is topped with mashed potatoes, toasted under the broiler, then topped with French fried onions." Mix soup and milk, then add pepper and green beans. Remove from oven and stir casserole. Top with prepared mashed potatoes. * You can substitute two (9-ounce) packages of frozen green beans, thawed, for the 2 cans green beans. This was very good. 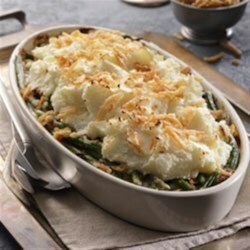 It is a step up from your "standard" green bean casserole. This recipe was easy and family loved it. Although I don't use instant potatoes for recipes, boiling up my own and adding garlic and fresh pepper, just made it better!